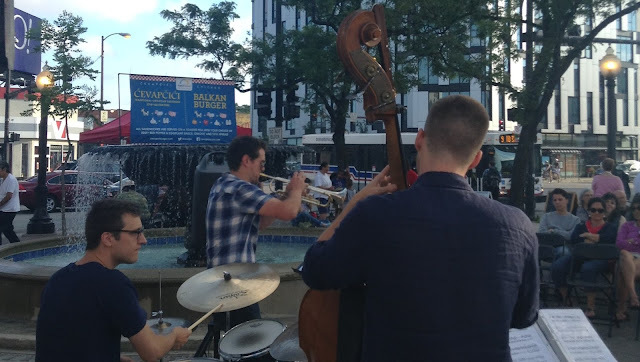 Detroit's Michael Melis Trio performs in July at the Polish Triangle. Catherine Garypie suggested the Aussie Pet Mobile dog-grooming service as a potential Business Minute for the Dec. 7 meeting. Neal McKnight said EVA needs a new liaison to the Polish Triangle Coalition planning committee. This could be a rotating position, with a different EVA rep attending when available. Stephen Rynkiewicz will help draft bylaws for the group, which has been operating through Friends of the Parks. The East Village Association is a founding member of the coalition, which sponsors summer performances at Division, Ashland and Milwaukee. Leona’s closes: Catherine Garypie, Scott Rappe, McKnight and Rynkiewicz went to a Chicago Landmarks Commission meeting, unsuccessfully attempting to block a demolition permit at 1944-46 W. Augusta Blvd. They were joined by Ald. Brian Hopkins. We are still seeking documentation for the provenance of the building. Ace Hardware: Developers of a condo complex at 1011-23 N Ashland initially planned to build within current zoning, but now are requesting permission to build a bit bigger at the longtime hardware-store site. They would like an upzone, presumably to take advantage of the new Transit Oriented Development ordinance that cuts parking requirements. 1531 W. Haddon: The buyer continues to claim she was misled about the zoning of the purchased property and would like EVA’s endorsement of a zoning change. EVA does not feel it should be involved in this issue. Meeting was called to order at 6:33pm. Attendance: Rich Anselmo, Gladys Alcazar Anselmo, Elaine Coorens. Brian Foote, Catherine Garypie, Marjorie Isaacson, Dan Johnson, Jordan Marie, Neal McKnight, Daniel Navarro, Scott Rappe, Stephen Rynkiewicz.